Designers and engineers are always taking inspiration from nature. It’s no surprise aerodynamics engineers are looking at Owl wings for developing stealth propellers that make much less noise than traditional propellers. Shifting scales a bit, a new 3D printed concrete bridge has opened up to 2 wheel commuters in the Netherlands. Check those stories out and more in this weeks newsletter. Researchers at Iowa State University are using 3D printing to develop propellor blades inspired by owl wings. The innovative designs could lead to quieter aircraft, wind turbines, and other machines. The Dutch town of Gemert has just opened the world’s first 3D printed concrete bicycle bridge. While the bridge might not look remarkable to the uninformed observer, the concrete 3D printing technique used to create the Gemert bridge makes it something of a global landmark. 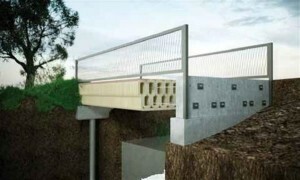 The most important feature of the 3D printed bridge is its eco-friendly construction process. Much less concrete is needed to 3D print structures like this than to build them in traditional ways, since the printer deposits the concrete only where it is needed.